Beach chairs, picnics, music and relaxation all make for a perfect combination to enjoy a summer evening. 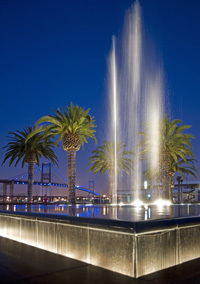 The Port of Los Angeles' first summer outdoor concert series will take place at Gateway Plaza Fanfare Fountain on Harbor Boulevard, just south of the Vincent Thomas Bridge in San Pedro. On Thursday evenings from June 23rd through September 8th, come to Fanfare Fountain, one of California's largest and most spectacular waterworks, for a water show followed by a free two-hour concert. The concert series will feature a different band and genre of music each week ranging from local favorites like 110 South to The Smokin' Cobras, a family friendly country and rockabilly group playing hits from the '50s-'80s. Don't miss your last chance to enjoy a summer concert, Thursday, September 8. Be there!